Alternative to chocolate bars, crisps, and other fat and sugar saturated snacks? 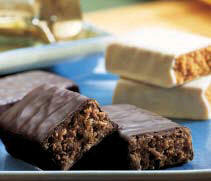 Whether you’re looking to control you weight or build muscle, reach for a Thermojetics ® Protein Bar. You’ll get the protein your body needs and a great snack all in one! Herabalife's Protein bars are a perfect solution. Whenever you need a power packed snack, reach for a Thermojetics ® Protein Bar and give your self a nutritionally balanced treat.